RANKX-apalooza: Within and Across Groups, With Filters, Etc. The IF(HASONEVALUE(),…,BLANK()) test prevents us from ranking subtotals (like region) as if they were stores. And we RANKX() against ALL(Stores) because that’s what we want here – each store’s rank versus all other stores. Only thing different here is that we rank against ALL(Stores[Store Name]) rather than ALL(Stores). Which means we clear the filter on Store Name, but *keep* the filter on Region, which means we end up just looking at all of the stores in the current region. So what if we want to do something like this, where we rank Regions rather than individual stores? In both cases, we rank across ALL(Stores[Region]) because that does produce a list of just the regions (with all regions filters cleared). 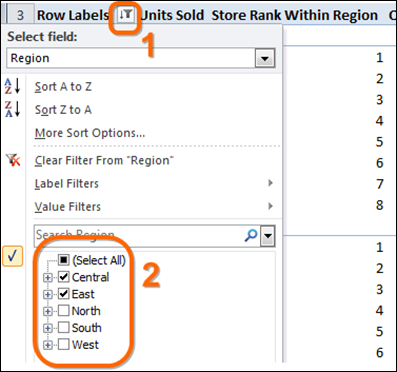 But in the second case, we just rank using [Units Sold], whereas in the first case, we need to clear the Area filter before fetching the values for [Units Sold] – so that we “count” regions in other areas “against” regions in the current area. Yeah, a bit weird. This is why I have a reference workbook – cool results, but difficult to re-engineer every time I need them. …but the post is running long and getting more intensive than I think is healthy. Another brilliant post by a brilliant person. Thank you, Rob! Thanks Ron! Glad it’s helpful. Let’s say that in this example, I rank against Unit Sold THIS YEAR and with the help of SWITCH TRUE, I only show the top 10 stores of all regions. Any idea how I can also display the Unit Sold LAST YEAR of these top 10 stores??? This way, you can see if the presence of a particular store is caused by huge progression vs last year or if it seems normal. Thanks for your time to show applications for the RANKX function; I have pegged this page into my memory. Also helpful was the section where you mentioned you keep workbook(s) of examples for functions that can, at times, be perplexing. There are definitely at least some DAX functions where I have had a flash of insight to implement a solution, but not kept a record in an examples workbook, only to find myself later pouring over multiple formulas in various workbooks to find that “right” one. I don’t know if it’s the right place to ask, but I have a nut too hard for me to crack, around those RANKX/FILTER and that would be great if you could help me just a little. In yellow the facts, in orange the intermediary measures, in green what I’m trying to acheive. and sorting the rank and filtering the top 3 rank, but that would force me to keep the “Brand” column. Rob – is this sample file posted somewhere? Please consider including a non-normalized example. I have been hunting for weeks for a RANKX example where there is only 1 non normalized Table. Please show me how to RANKX on the ‘SALES'[Store ID] field without the Stores table? As though there is no Stores table and therefore the summarizing column has duplicate values. Where you have “RANKX(ALL(Stores[Store Name]), [Units Sold])” in your first ranking, what would you replace the “ALL(Stores[Store Name])” with if there was no related table with just the stores? I understand this might be a forum Q, but as I haven’t been able to find a post anywhere I am trying to suggest it hereas an extension of this post. Perhaps this context related Q has a different place in the blog postings that I have missed. Being a newbie to DAX it would be great to have the source tables for following along. It’s the best way for learning, agreed? Excellent post, how could know how many stores there are in “top 10” with the measure Overall Store Rank for each Region? For example, Central has 2 , Store x and Store ZZ, East has Store HH, QQ2 …. Hi Rob, thanks for your post. I’m trying to follow the steps outlined here, but no matter what, it always ranks everything as 1. I’m using a single flat table and trying to rank cities by sales. The formulas are sum of sales = SUM(Orders[Sales]) as a measure and RANK = RANKX(ALL(‘Orders'[City]),[sum of sales]). Any ideas why this wouldn’t work? Thank you! I used RANKX on a table that has a many-to-one relationship with a Date table, yet when I set a page filter for current year, current month in a pivot table page filter, I get ranks for all rows in the table, as if there is no context filtering from the Date table. For example, if I have a Date table with child Order table and grandchild OrderDetail table (for order line items), and I constrain Date table to May 2016 dates, RANKX(Order,[SumOfPrice]) ranks all rows in the Order table, as if there is no filter context coming from the Date table (as if expression were RANKX(ALL(Order),[SumOfPrice])). Why do I get this behavior. I have created the relationships between the tables in Power Pivot, so why is there no context filtering on the table argument of RANKX when I select only certain dates from the Date table in the pivot table? Stephen, did you ever get this resolved? This is the issue I’m troubleshooting right now. Thx. Thanks for all your contributions and for publishing them in a fun and comprehensible way! Hi, I can get this to work when ranking based on high number, example: when highest sales = rank 1. When flipping this to rank based on lowest number = rank 1, the rank by region is calculating incorrectly. Can anyone please help? I am trying to create a ‘Store Rank Within Area’. I need the rank of the store within the areas, and I need this to remain the same when filtering specific regions. In the example above, could you please share how to do this? Thank you Rob for this great post ! How do you calculate this measure : [Overall Area Rank] ?